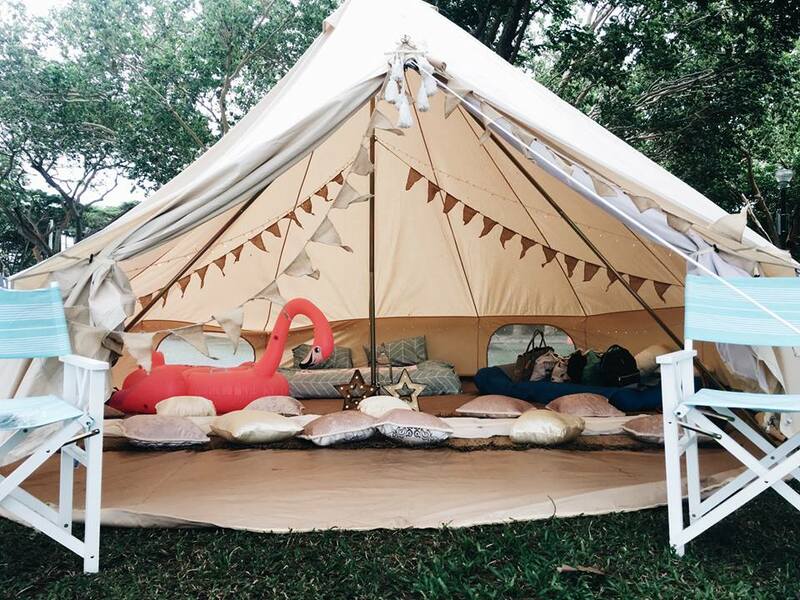 If you own a Tumblr or a Pinterest account, you’ll probably have seen picture of glamping – large, spacious tents furnished with stylish bedding, cushions, and accessories. For those of you who are coming across the term ‘glamping’ for the first time, it’s a combination of two words that typically don’t go together: ‘glamourous’ and ‘camping’. 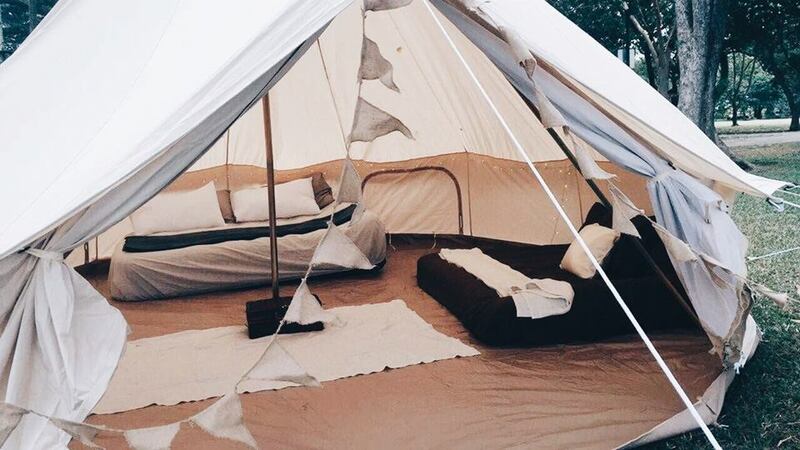 Like the term suggests, glamping is camping with a chic twist. 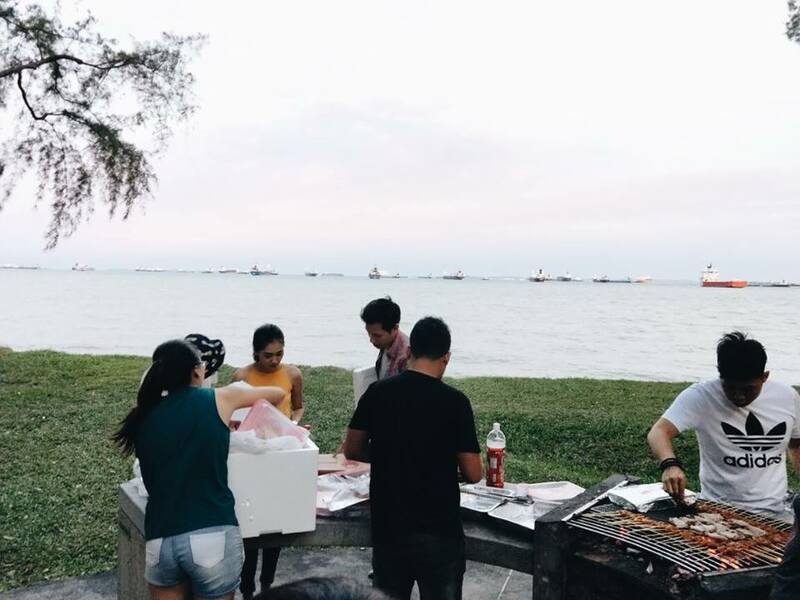 Now, this Instagram-worthy trend is available on our very own Singaporean shores! With Glamping Society, you won’t have to move a muscle – all the heavy lifting is done for you. Everything is set up nicely for you, so all you have to do is bring your own clothes, toiletries, and entertainment. 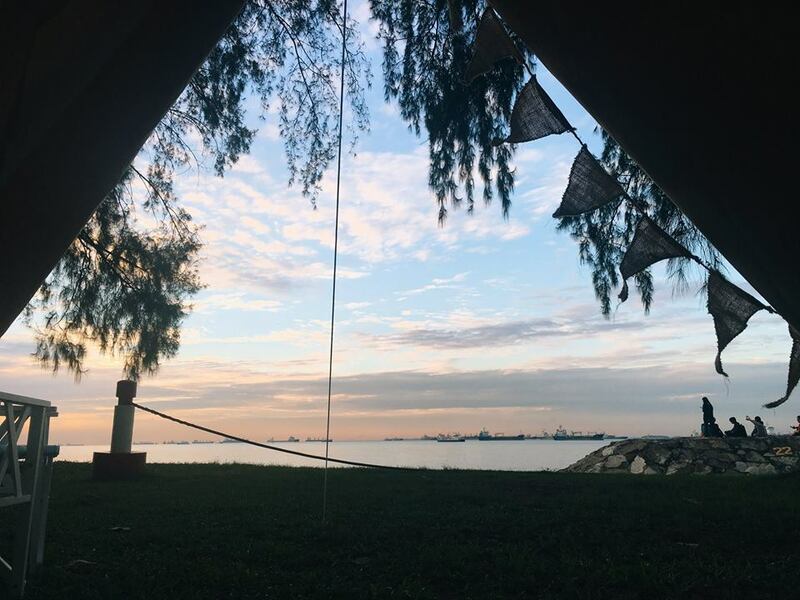 Here’s what went down during our 2 day 1 night glamping experience at East Coast Park. 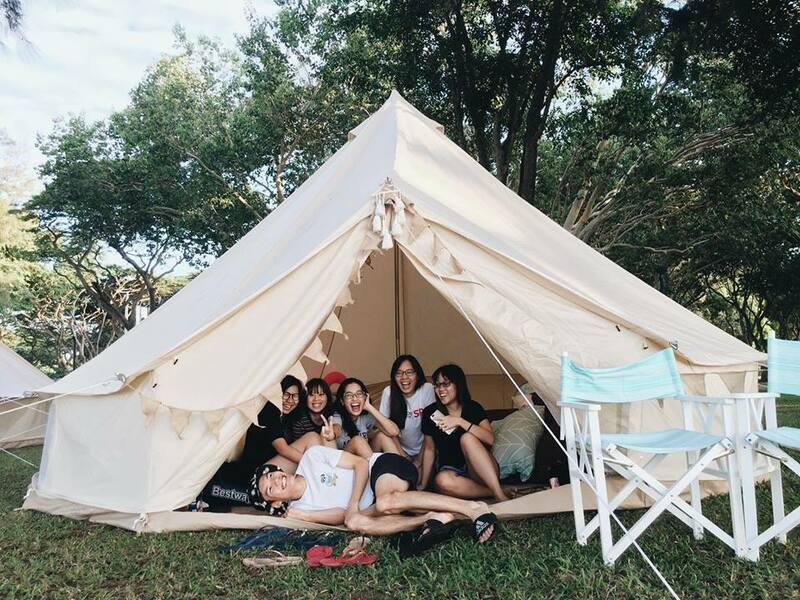 Because a total of 20 of us were glamping, Glamping Society gladly accommodated our request to have 3 tents. While each of the bell tents can accommodate up to 6 people, we felt that the main tent (the most spacious tent) was big enough to fit 2 or 3 more people comfortably – you just need to bring your own extra sleeping bags. 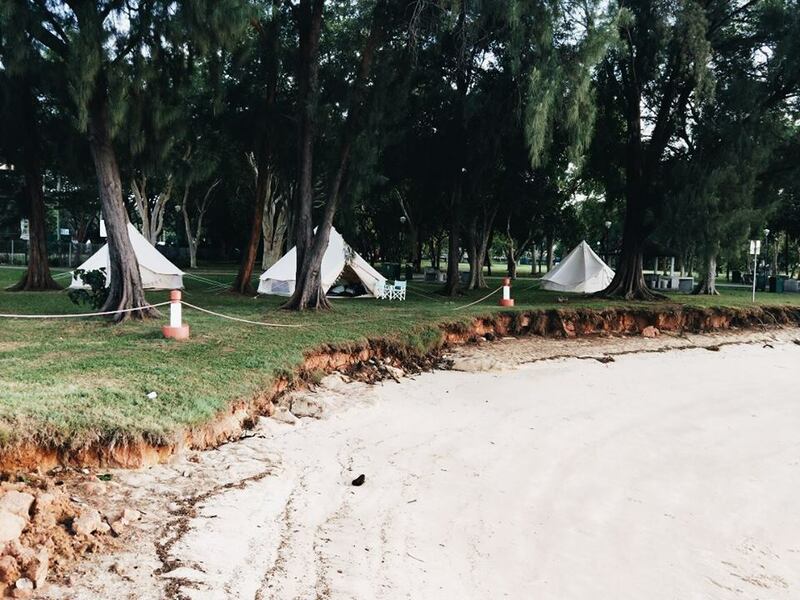 When we saw the tents fully set up, we were impressed by how pretty it was. 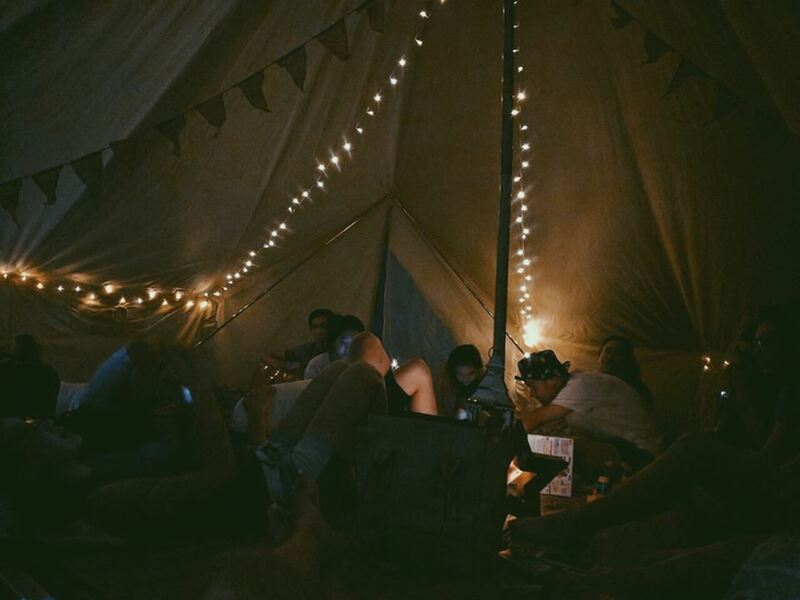 The plush cushions, fairy lights, buntings, and overall bohemian look provided the perfect setting for hipster Instagram photos that’ll make your friends green with envy. There was even a big flamingo float in the main tent! While it was pretty random, we have to say it made for some pretty cool photos. While the two smaller tents didn’t match up to the main tent in terms of decorations, it was still comfy and welcoming with amenities like airbeds, cushions, a fan, a mini bar, and a cute picnic basket. We were pleasantly surprised by the snacks and chilled drinks provided. Unlike the mini bar of a hotel, you won’t have to pay extra for consuming the goodies they’ve provided. Another treat we didn’t expect was the working fan – a clever touch that ensures it doesn’t get stuffy in the tent! We brought our own card games like Monopoly, Cards Against Humanity, etc. We also brought a guitar and sang songs! In all, we had a lot of fun barbequing, playing card games, and lounging on the airbeds as we stayed up all night talking. 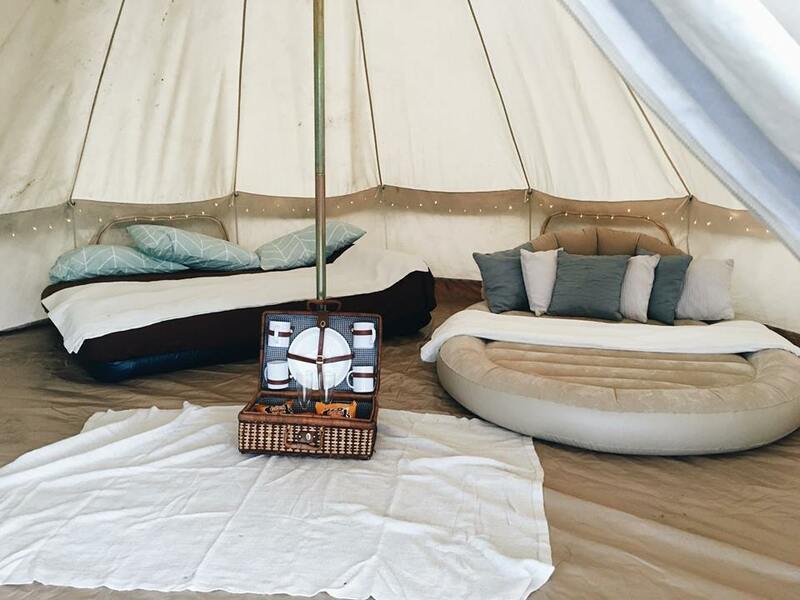 Taking into consideration factors like comfort, aesthetics, space, amenities, and cleanliness, here’s what we loved, what we didn’t love as much, and a couple of tips for you to keep in mind for your own glamping adventure! What we loved most about our experience had to be the pretty decorations. 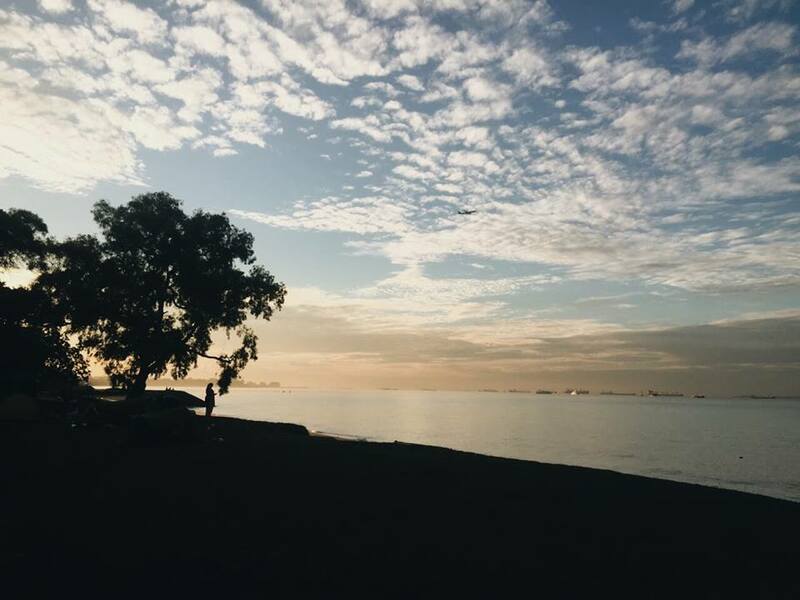 They made for pretty photos and gave the tents a romantic, cosy atmosphere at night – great for heart to heart sessions with friends and even better for cuddling with your partner! We also loved that the main tent was spacious enough to fit all 20 of us. A refreshing alternative to a hotel staycation, it was definitely a unique experience for all of us. We also liked that snacks were provided – these came in very handy when we were hungry in the middle of the night! While our experience was great for the most part, we wish the two smaller tents were jazzed up a bit more. A flashlight would have been a handy addition to the amenities, especially since it was quite dark out at night. Another issue we had was that the air beds deflated with time, but at least they provided us with air pumps that made it easy to re-inflate them. We stayed at Area G, which is very far away from the main hub of East Coast Park. While this might mean peace and quiet away from crowds, you won’t be able to find any food near you. If you pick this location, make sure you bring plenty of snacks and drinks to avoid going hungry or thirsty! Also, consider where the public toilets are when picking your tent location. You don’t want to have to walk a distance when you need to take a leak in the middle of the night. So, make sure you check out the map before deciding on where to set up camp to ensure you get the most ideal glamping spot! 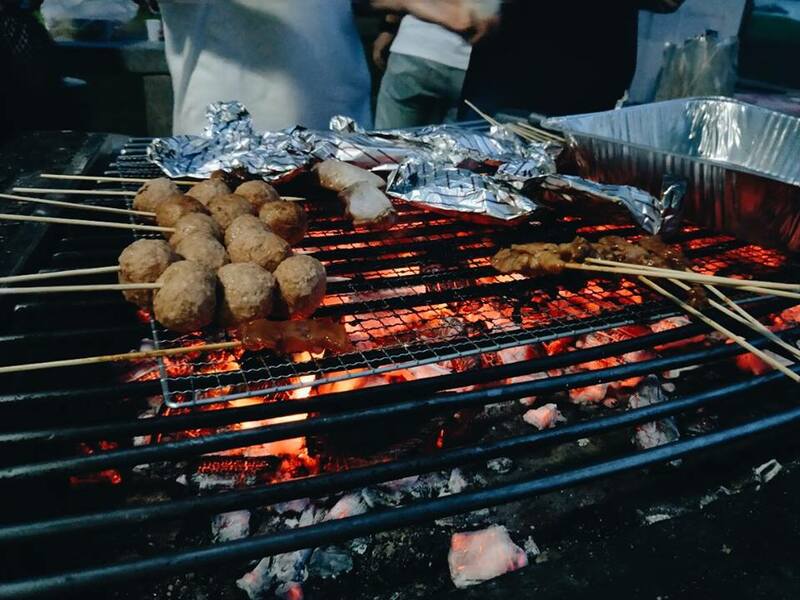 If you intend to have a BBQ party while glamping, you can request for your tent(s) to be pitched near certain BBQ pits. Just note that the official camping sites are areas D and G, so be sure to book the BBQ pits in those areas. If you’re not a fan of bugs, zip up your tents fully before settling in for the night. You don’t want to have to deal with a cockroach entering the tent at 3am in the morning like we did. While Glamping Society provides plenty of luxurious amenities, you’re in charge of creating your own fun. 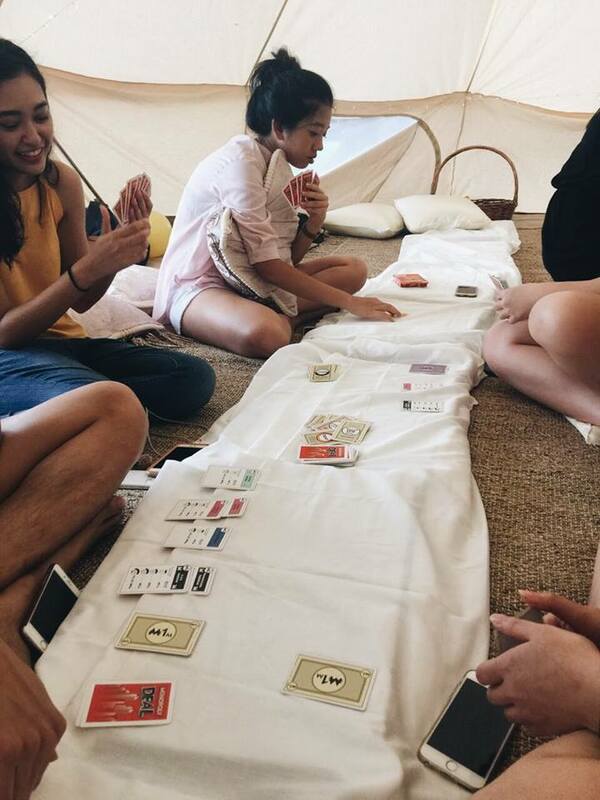 Bring card games, portable speakers to blast your favourite songs (Glamping Society also no longer provides speakers due to constant damage), a guitar, and good company for a truly fun time! 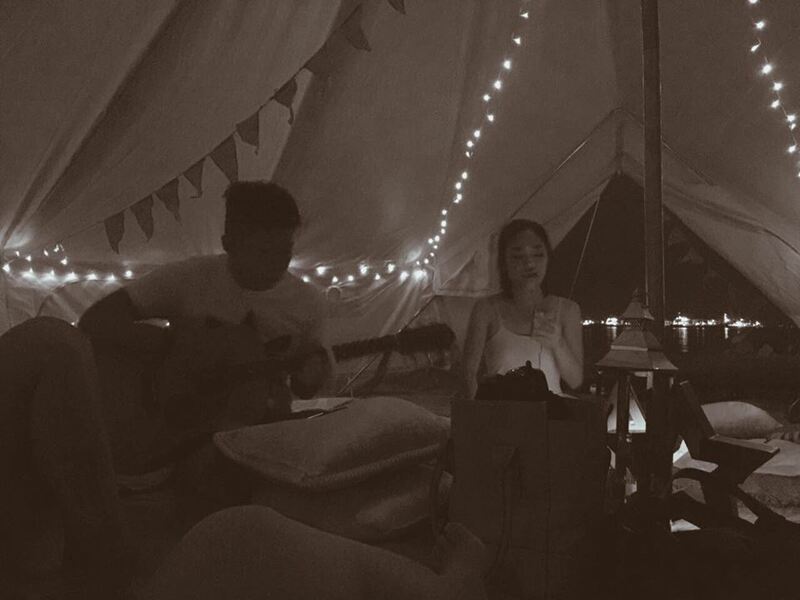 In all, we had a blast glamping. The tents were pretty, clean, spacious and sleeping arrangements were comfortable – at least for most of us. A totally unique experience, this is definitely something you should try at least once in your life! To book a tent for yourself, check out their website here.